Doctor Who‘s seventh series starts off in style, offering a very strong story and bringing some excitement and danger back to the Doctor’s most dreaded foes while exploring Amy and Rory’s relationship further. 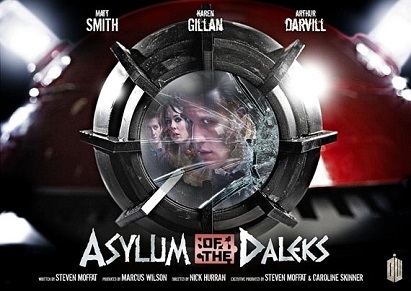 Yet for all that ‘Asylum of the Daleks’ manages to achieve, it’s the surprise appearance of Jenna-Louise Coleman- she who has been cast as the Doctor’s new companion starting in the upcoming Christmas special- as Oswin that’s going to provide just as much of a talking point as anything else. For here she is, seemingly fated to an existence as a Dalek before the planet she is on blows up, five episodes earlier than when the Doctor is slated to meet her. That’s an interesting plot thread to ponder over and explore, to be sure. The Amy and Rory seen here- quite some time after the events in ‘The Wedding of River Song’- are on the brink of divorce, seemingly because Amy is incapable of having children. Both Karen Gillan and Arthur Darvill are in superb form here, excellently portraying the necessary emotion of a couple who has been through so many incredible and heart-wrenching events together and, as a result, almost forced them to remain together. Whether the Doctor’s intention or not, his inclusion of the two here at a time when they are perilously close to separating finally allows them both- and especially Amy- to admit how much they need each other and to reconcile their differences. This is Steven Moffat’s first full-fledged Dalek script, and he wastes little time in bringing in new ideas and concepts. After quickly being introduced to a new sort of Dalek hybrid where the Dalek eyestalk protrudes more naturally out of the human host, the Doctor is summarily brought before the Daleks who are on the edge of defeat. They need him to go on a suicide mission to the Daleks’ asylum, the place where broken and malfunctioning Daleks are put and revered for their ‘divine hatred,’ in order to save them. This is an incredible idea, allowing for many past variants of the Daleks from the classic series to be put on display. Even though most are in a state of hibernation or dormancy, the ominous presence of them and the slow stirring certainly adds a great deal of tension to proceedings. And it’s made abundantly clear that one Dalek can be a lethal force, perhaps effectively more so than an entire legion of Daleks. Like the Doctor, the companions are put through a lot in this story, both emotionally and physically, and all three leads are at their best here. At least to the Daleks, the Doctor’s assumed death at the end of the last series doesn’t diminish his importance to them, whether this is due to his presence throughout tie or not. Interestingly, though, Oswin as the Dalek has access to the collective mainframe or sorts and manages to clear any reference to the Doctor from their knowledge banks. This results in a fantastic scene between the Doctor and the Daleks as he realizes this fact, but it also opens up an endless potential of storylines going forward, essentially hitting the reset switch on their entire history from the Daleks’ perspective. This is not the typical story where the Daleks are proving victorious until the timely intervention of the Doctor, and the story is all the stronger for it. The ambition and scope of this episode is fantastic, and it certainly meets the criteria for the weekly blockbuster that Moffat has promised. Shedding new light on and repairing the core relationships while making the Daleks more threatening once again and raising new questions about the Doctor’s battle with the Daleks is no easy task to accomplish in one episode, but Moffat manages it deftly. Added to the surprising injection of intrigue regarding the newly-announced companion and the possibilities that these new stealthy Dalek hybrids offer, and ‘Asylum of the Daleks’ gets the new series off to an incredibly strong and engaging start.